#35 Woodwork | Fairies, and Toadstools, and Witches–Oh My! Since I haven’t picked out my new woodworking project yet, I thought I’d show you some projects that Todd and I worked on together in the past. Our first year living together we threw a Midsummer-themed housewarming party, but it wasn’t exactly what I’d envisioned. So when we moved again and took another shot at our Midsummer Fairy Fest ( not a housewarming party, this time), I shamelessly took advantage of Todd’s willingness to help, and cooked up these little guys. 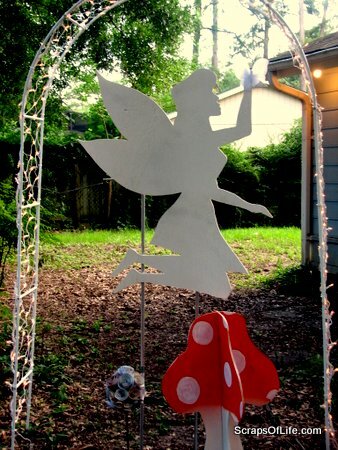 We made 3 fairies and 5 toadstools from 4, 4’x8′ sheets of plywood and still had some leftover. Of course, lacking a truck, we had the hardware store cut the boards into 4’x4′ squares with the thought that they’d fit in the backseat. Lengthwise, sure, but they were still too tall to fit through the door. Oops! This is yet another reason Todd keeps a bundle of bungee cords in his trunk. To keep the shapes workable in our 4’x4′ wood, I drew out my designs on a square of cardstock and then measured out a grid over top. Remember those pages in the coloring books where you’d have to transfer a picture by drawing each square, one at a time? Yup, same thing works here. I laid out a grid over my picture, with each square equal to 6 inches, and then Todd could measure out a grid on the plywood and transfer the picture there. I cleaned up some of the details before he cut the first one out with the jigsaw, and then he used that first one to trace out the other 2. The toadstools worked pretty much the same, only we could fit 2-3 pieces on each square of plywood and it took 2 pieces for each toadstool–1 with a notch from the bottom, 1/2 of the way up, and 1 with a notch from the top, 1/2 of the way down. The great thing about this was that we could combine 2 pieces to get a 3-D toadstool but take them apart to stack in the off-season. 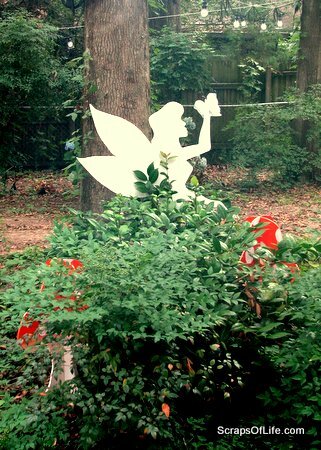 The fairies were painted white and then sprayed with a bit of silver glitter. The toadstools got a coat of white, a couple coats of orange for the caps, and then white spots painted on. We scattered them around the back yard, nestling some in the camellia bushes on our patio. A white, gauzy butterfly on her hand and it was done. 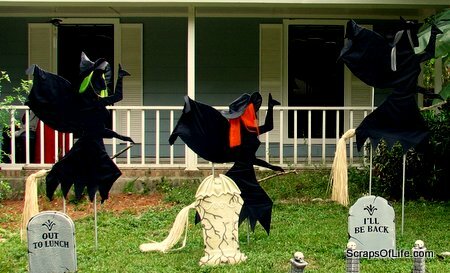 When Halloween rolled around we really wanted to dress up the yard more and I thought back to the fairies. With some rip-stop nylon stretched over them and stapled in place, a witches hat & wig combo, and a broomstick made of a branch from the yard and some grass table skirt left over from a beach-themed wedding shower we threw ages ago. I left the wings loose as if it were a cape fluttering in the breeze, and dagged the skirt at the legs. I didn’t plan it this way, but the leg and hand pose fit the idea of sitting across a broom perfectly. All lined up you can see how we cut the conduit to different heights. On the back of each are two metal conduit straps for each conduit leg and a small cup hook to act as a stop for the conduit so they won’t slide down the pipes or flop around in the breeze. I want one. SEriously. Are you opening up an Etsy shop? How about I make sure you get a copy of the pattern when I find it again–I’m pretty sure the shipping on something like this would be astronomical, way more than the materials would be to make it yourself! As to Etsy, I have a shop, there’s just nothing in it at the time being. Gotta work on that!